Mother's Day is less than two weeks away, so it's time to start thinking about gift ideas! Show your mom some extra love this year with a high-quality, unique gift from House Of, all while supporting our local, ethical brands. ABLE Debre Wallet ($58) - This wallet is the perfect size for travel or just for running errands. It's made of real leather and in a style any mom is sure to love! Wink Wink Paper Co. Card ($4.50) - Skip the generic grocery store cards this year and give your mom a personal, adorable card she'll remember with one of these Wink Wink cards! We have several great designs for Mother's Day in stock. Bela Begonias Chrysoprase and Labradorite Teardrop Earrings ($76) - It can be hard to buy jewelry as a gift, but these beautiful, handmade silver earrings make the perfect gift for the mom who already has a large jewelry collection. Thistle Farms Gift Set ($30) - This set includes a body balm, shave gel, body lotion, body wash and body butter. All of the products smell amazing and are handmade by women survivors of trafficking, addiction and prostitution. You can buy the whole set for a gift, or just buy individual products for $6.50 each! The Vintage Sparrow Mama Bear Necklace ($26) - Show your mama how much you appreciate her always looking out for you with this adorable, unique piece from The Vintage Sparrow. Garner Blue Vintage Napkin 4 Pack ($28) - These napkins are hand-dyed with indigo, so each set is a one-of-a-kind work of art, making them a perfect gift! Stop by House Of today for all of these gift possibilities and many more! Looking for some last-minute little gifts to fill a stocking or cross a couple more people off your gift-buying list? House Of is the perfect place for you! We have presents for every person in your life, and every product we carry is ethically and locally-made! Skip the stress of last-minute Christmas Eve shopping and stop by House Of sometime in the next couple of weeks to finish your holiday shopping in style! [a][di][a] Candle Co. Tin Candle ($12) - Not only do these hand-poured soy candles smell amazing, [a][di][a] also donates 50% of its profits to charity. With scents like aged spruce, drury lane (gingerbread and pumpkin) and crafted vanilla noir, these candles smell like Christmas, and they're the perfect size to fit in a stocking! Bloom Brightly Paper Co. Holiday Card ($6.50) - Not only are these cards adorable, they also can be planted and grow into basil plants! These cards make the perfect addition to any gift, especially for the cooking or gardening afficianado. Sweet Charity Fudge ($8) - No stocking is complete without candy, and this fudge, available in peppermint and original flavors, is the perfect holiday treat! All of the profits made through selling this fudge are donated to charity, and this year the money is going to the non-profit Feed My Starving Children. It's only available from Thanksgiving until Christmas each year, so get it before it's gone and support a great cause in the sweetest way possible! Vintage Sparrow Gold Bar Earrings ($9) - These earrings are so cute and simple, and they're a perfect little surprise to stick in a stocking or under the tree. They're made by local Nashville artist Annie Moss and her employees, and a portion of Vintage Sparrow's profits go to charity. Thistle Farms Healing Oil ($10) - With four unique blends — calm, energy, immunity and balance — and easy roller-ball application, these essential oils are all-natural and extremely effective. Add one of these tubes to a gift to show someone you want them to be happy and healthy. Clary Collection Balm ($18) - With ingredients including lavender, chamomile and plantain, this all-natural beeswax balm is the perfect product to use on chapped lips or dry skin. Give the gift of pampering while also helping the environment with this 100% organic product. Bela Begonias Tiny Zodiac Tag ($39-$45) - Give a personalized gift with this tiny tag necklace. These necklaces make the perfect accessory for any outfit, and they're handmade by a local artist. We carry all of the zodiac signs in both gold and silver, as well as many other tiny tag designs! House Of Gift Card - Skip the guessing game of trying to find the perfect present for that person who's impossible to shop for with a House Of gift card. You'll give them the chance to shop for themselves and support local, ethical designers. What better gift could there be? On today’s gift guide, we’re highlighting some of our favorite home decor pieces. These products make perfect host and hostess gifts or Christmas presents for parents and friends. Stop by House Of today to get them in time for the holiday season! Garner Blue Indigo Throw Pillow ($56) - This pillow is hand dyed with all natural indigo, so not only is it a great decoration, it's a unique and memorable gift for anyone who loves to decorate! Bela Begonias Holiday Vase ($60) - This vase is so Christmas-y, and it's handmade and painted by a local designer. Treat someone to a one-of-a-kind gift while also supporting local art by giving this vase as a gift. 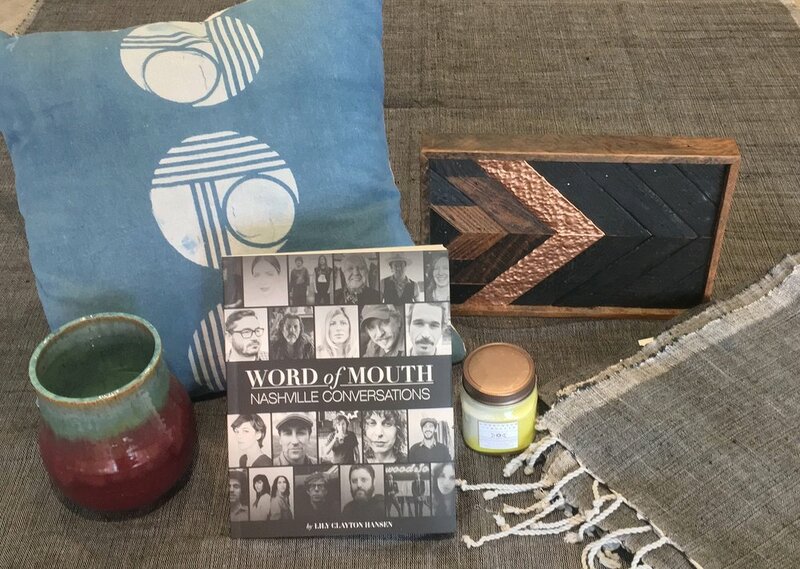 Word of Mouth Nashville Conversations Book ($30) - This book features short little stories of interesting people around Nashville, and it's the perfect coffee table book for the storyteller or Nashville lover in your life. Nella Moon Candle ($18) - Pictured in the cedarwood and vanilla scent, these hand-poured soy candles smell amazing! They're handmade by a Nashville artist, and the adorable mason jar packaging makes them a memorable gift. 1767 Designs Claiborne Dusk ($95) - 1767 Designs are made from old houses around Nashville that have been torn down. This particular piece was made with wood and metal reclaimed from a house built in 1930, and it can be displayed as a wall hanging or stand up on its own on a bookshelf or desk. ABLE Oda Throw Blanket ($58) - This blanket is stylish and big enough to wrap up in on a cold day, making it a perfect gift (who doesn't love a nice blanket?!). Even better, ABLE products are all made by women in poverty around the world, providing them with sustainable employment and better lives. These products are just a few of the many great gifts available at House Of. Stop by today to find something for everyone on your list!